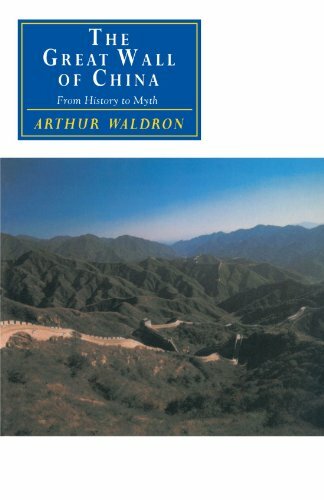 The Great Wall of China: From History to Myth by Arthur Waldron covers the history of the Great Wall and the myths which have developed around it. Many people still believe, for example that the Great Wall is the only man-made structure on Earth which can be seen from space. Even educational videos found online repeat this claim as though it is a fact when, actually, it is a myth. An English writer named Sir Henry Norman wrote in 1895 that the wall could be seen from the Moon because he could see craters on the Moon and assumed that something as massive as the wall would be seen by someone up there. The myth is always cited as though the wall has actually been seen by astronauts who landed on the Moon when actually the story was started by a man who lived before space travel was even possible. This is just one of the myths Waldron explores in his very insightful book. Another popular misconception is that the Great Wall was built during the Qin Dynasty (221-206 BCE) under orders from Shi Huangdi when actually very little of the First Emperor's wall remains. Shi Huangdi commissioned his wall as a barrier to nomadic cavalry but also as a symbol of his dynasty. He had just conquered the other six independent states of China who all had built walls around their territories. Shi Huangdi ordered these walls torn down and his wall built along the northern border as a symbol that there were no longer any independent states in China, only a unified country under his reign. Shi Huangti's wall was not very tall or very long, and the Great Wall people admire today was actually built during the Ming Dynasty (1368-1664 CE), including the impressive watchtowers. Along with dispelling myths like these, Waldron covers the history of the wall from the first attempts by the Qin Dynasty through the additions made by later rulers and to the great achievement of the Ming. He also deals with the neglect the wall suffered following the Qing Dynasty (1664-1912 CE) when it was no longer considered necessary for defense. Waldron's writing style is very interesting and easy to read and is nothing like a textbook on the subject, which can be a little dry. Waldron has very extensively researched his subject and every historian who has ever written on it for this book but makes the subject much more interesting than these other writers. The book has a glossary and index and numerous maps and graphics. The images in the book are the only downside. They are often reproduced on such a small scale that they are difficult to read. I have no problem with my eyesight and I had to get a magnifying glass to read some of the maps. I like to see a general overview of a region I am reading about, so I would have appreciated larger maps. That is a small criticism, though, when one thinks of the value of this book for anyone interested in the true history of the Great Wall of China. Waldron published his work in 1990, and it is still probably the most comprehensive book on the subject available or, at least, the best one I have read personally. If you are looking for a book on the Great Wall, this is the only one you will ever need. Waldron, Arthur. "The Great Wall of China: From History to Myth." Ancient History Encyclopedia. Last modified March 12, 2016. https://www.ancient.eu/review/111/. Waldron, Arthur. "The Great Wall of China: From History to Myth." Ancient History Encyclopedia. Ancient History Encyclopedia, 12 Mar 2016. Web. 18 Apr 2019.